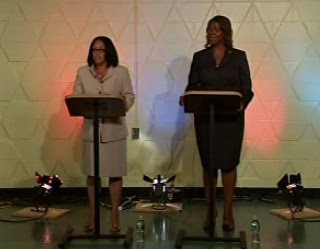 A News 12 debate taped last Thursday between 35th District Council incumbent Letitia James and challenger Delia Hunley-Adossa shows both candidates going at each other, unlike in their previous debate, when James tangled with third candidate Medhanie Estiphanos. 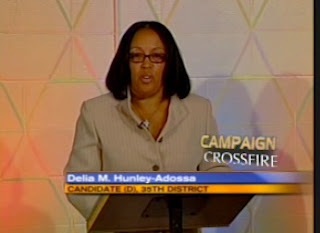 Hunley-Adossa spoke somewhat more effectively than she did in the previous debate. Despite lobbing the same charge against James, she showed her focus was essentially Atlantic Yards, which she repeatedly pronounced herself in agreement with. She also claimed--for the first time publicly--that half the money received by her nonprofit, Brooklyn Endeavor Experience (BEE), went to air conditioners for her building--a curious example of Forest City Ratner routing money through a third party rather than simply doing the job itself, as it has done for other residents of the area around the AY footprint. It's a reminder that the pleasantly-named BEE, whose board members are Hunley-Adossa's family and neighbors, was originally called the First Atlantic Terminal Housing Committee. The debate started off inauspiciously, with the moderator mispronouncing both their names, and incorrectly calling the absent Estiphanos a "she." Hunley-Adossa got the lead-off statement: "I am running for the City Council because I have a passionate desire to make a difference and bring social transition and change to our development. I'm a lifelong resident. I have volunteered in the community for over 30 years. I have raised my family. And I am for the people, and will be a representative for those people in the community, and that means all of the people in the community, not just a few or just some. I am a representative for all the people. My record speaks for itself with my volunteerism and the love and the passion that I have. I will be the better candidate for you." That's not much of a platform. What exactly "social transition and change" means is unclear, but, according to Hunley-Adossa's later statements, it apparently means that she agrees with Atlantic Yards. James started off with a tribute to the recently deceased Senator Edward Kennedy, then offered more details than did Hunley-Adossa (though her use of the third person got awkward): "When tough decision needs to be made in this city, this district needs someone who is transparent, who is responsible, who is honest, and who is accessible. This district needs someone who can stand up when the administration recommends to close day-care centers and senior centers. When this administration recommends to build out-of-scale developments that would harm this community and divide this community. This district needs someone who will stand up and speak truth to power and who has consistently spoken truth to power, particularly when this mayor wanted to do an end-run around democracy and wanted change term limits. It was this City Councilperson who led the way. It was this City Councilperson was in the forefront of just about every issue in this district, including public safety. This district needs someone who again will challenge mayoral control, and who will bring transparency and who will empower parents and who will empower teachers and empower educators... This Council Member and her office has been responsible for resolving countless number of complaints in this district and we will continue to do that again." The moderator asked them about AY. James said she has "stood out loudly against the Atlantic Yards project," saying that the original idea--a 20,000-seat arena and 16 skyscrapers--would divide Prospect Heights from Fort Greene and Clinton Hill and be "totally out of scale with the brownstone community." She said it was a project devised by "a developer from Ohio," that it was not subject to ULURP, the city's Uniform Land Use Review Procedure, and now "only focuses on an arena, and not affordable housing, where the need is." She touted her support for the UNITY plan, and said she's knocked on thousands of doors, with "not one person" saying they wanted an arena but instead favored affordable housing. Hunley-Adossa said, "I'm in agreement with the Atlantic Yards project. And contrary to what the councilwoman said, I can recall, when she was the chief of staff for Assemblyman Roger Green... at one point, she was in total agreement with the CBA." James chose not to rebut that. Hunley-Adossa also pointed out that developer Forest City Ratner has been in Brooklyn "for well over 18-plus years." (FCR is the New York subsidiary of Cleveland-based Forest City Enterprises.) She also charged that James was part of initial discussions for the CBA with clergy who later backed out. She said that she previously protested FCR developments but had not seen elected officials respond to her request to "please bring amenities to the community." So when James's predecessor, Council Member "James E. Davis had brought to our attention that he was going to be negotiating a CBA, I felt I wanted to be a part of that, because I no longer wanted to be shortchanged." The moderator asked if the candidates accepted the project completely or sought changes. "As it stands right now, I'm in agreement with it," Hunley-Adossa said, then lapsed into a bit of gibberish. "The way that it was, initially, just like the opposition, I had many, many concerns about the height, the constraints, the environmental impact and issues, which is again why I got involved." She said affordable housing will be a part of the project and ACORN should be commended for negotiating for 2250 units of affordable housing. 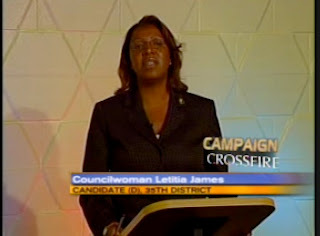 Then she charged that "at least 95% of the development n the 35th district has been nothing but luxury condo housing." James said, "The change that I accept is the UNITY plan" and charged that Hunley-Adossa supports the project because she has benefited from it. She noted that most board members of BEE "are her family members" and said most of the $100,000 or more" had gone into her salary. (Actually, most of the spending in the first and only extant IRS report went into Hunley-Adossa's salary.) "This money is basically hush money." Hunley-Adossa clarified that, of $400,000, $200,000 went to the Mitchell-Lama co-op, First Atlantic Terminal, on whose board she serves as president, for air conditioners and custom frames. "The benefits [of AY] far outweigh any harm that would come to the community," she said. "There is no reason for us to delay any further. There have been modifications to it. It's a good plan, it may not be perfect." She charged that there haven't been conversations about the environmental impact of other developments and said there had been no communication from the developers of a building on the corner--presumably the Fifth Avenue Committee's Atlantic Terrace--about rat and rodent abatement and particulate matter. James counter-attacked, saying, "It is not an either-or proposition. With the UNITY plan, you will have jobs." She charged that Hunley-Adossa's building doesn't have a working intercom system and that "she has not had a meeting in three years. A number of seniors are being evicted as a result of her action." (Hunley-Adossa didn't rebut this, but James hasn't raised this publicly, as far as I know, nor provide proof.) She said that "most of the luxury housing has been private, and not subject to the approval of the City Council. The affordable housing that will come online is Atlantic Terrace, 470 Vanderbilt, Navy Green, Myrtle Avenue, Classon Avenue. I have negotiated each and every one of them. At least 30 to 50% of the projects that I will approve will be affordable..."
The moderator tried to turn the question to housing in general, but the candidates couldn't avoid AY. James cited a project "I built, with the First Baptist Church of Crown Heights," then segued into criticizing the arena and the abuse of eminent domain. Hunley-Adossa charged that the City Council-passed Downtown Brooklyn plan--which, as I've noted, neither she nor AY allies protested--didn't include senior housing or a CBA, and it included eminent domain. (It did, but not on behalf of a specific developer.) "The Councilwoman says in the future, or futuristically, we're going to have development for seniors. But what about the last six years?" Asked about education, Hunley-Adossa gave a bland answer, emphasizing that "the mayor should not be the dictator." James cited libraries, math labs, and computer labs she'd supported--presumably earmarks available to any council member. And she went back to her support for affordable housing. Asked about health, James said, "We are working with Brooklyn Hospital, trying to improve their physical plant.... also working with Brooklyn Plaza Medical... also concerned about LICH... it's really critically important we focus on those who are uninsured... living with HIV and AIDS... children unfortunately living with asthma." Hunley-Adossa charged that James had not focused on these issues in the past, then returned to James's charges about her building. She said James had provided a letter for a grant that didn't apply to her building but instead for public housing. "Some of the same residents who may speak ill of me, may not pay on time, so those are grudges," she said. Then, in an charge that could well apply to herself, Hunley-Adossa said James's focus had been on Atlantic Yards. Asked about jobs, Hunley-Adossa cited the need to approve Atlantic Yards and said that, as a City Council Member, "my intentions are to negotiate with all developers." If so, she'll clash with Mayor Mike Bloomberg, who, despite his support for the Atlantic Yards CBA, now denounces CBAs as "extortion." Development expert (and AY opponent) Ron Shiffman has called for such issues to be addressed in public policy, so there's a level playing field. James said Hunley-Adossa has refused to meet with her, then said the economy needed to be diversified beyond Wall Street to focus on manufacturing, industrial, higher education, health care. She said she was working with the Navy Yard on "real jobs." James cited her record, saying she had not focused on Atlantic Yards but had produced affordable housing, open space, infrastructure improvements, and school improvements. She said she'd worked on public safety, which her opponent has not. Hunley-Adossa again counter-attacked, saying that James had not reached out on security issues for her building. "The people of the 35th District are tired of the rhetoric, tired of the photo ops." She blamed James for "the deplorable conditions in public housing" and said she deserved a vote because she is "honest, earnest, and loyal."